I’ve tried to devise a version of the theme just for guitar by incorporating different percussive effects for the rhythm together with imitations of the cello (the bass track) and the mandolin (second part of the chorus). My version remains absolutely faithful to the theme’s original harmony, composed by Ramin Djawadi. I didn’t want to modify the magnificent opening theme itself, but rather to modify the soundscape by substituting simple acoustic sounds for the symphony orchestra. I’ve nevertheless added a few flourishes to the main theme to make it more “guitarish”. With the piece in D minor, I tuned the low E string down a tone on the bass part to preserve the heavy, epic character of the music. Could you please give the game of thrones theme guitar notation in string-fret format ie. 5-3 (fifth string 3rd fret)? Hi, do you mean the tab notation here? 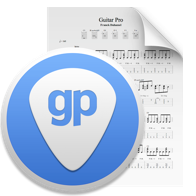 You can double click on the guitar track to display the notation of your choice. Hope this helps! wow nice job indeed , i will learn and own this one thanks from canada ! !